Rekha Nair Dhyani is not a fellow-blogger. Before anything, she is my friend who writes, and writes without any contradiction between her within and without. Her posts connect with me, as do the thoughts she carries inside. Dew Drops has seen her cry for her Lil Love, pull her hair handling her tantrums, shed tears remembering her grandmother and stand tall fasting for her husband. This, interspersed with philosophical posts and travelogues. Her blog appeals to the woman in me – all roles - mother, wife and daughter, combined. When ‘North met South’ a very loving person, rooted in tradition yet steadfast in her beliefs about her self, was born. Also was born a writer who speaks to your heart, because that is where her thoughts emerge from. No wonder then, that her request to me for being a ‘Guest’ on her blog, that too for my 100th post, made me jump so high with joy that I write this here even as I am sitting on the ceiling fan. Thank you, Rekha, for considering me up there, and putting me even higher than I probably deserve. Now, I am hoping nobody will switch the fan on. She told me write about anything under the Sun. So, I wrote about men in the kitchen. Only, and only because it rhymes. And yes, I am trying very hard to be funny in the post. Do spare a few giggles, and more importantly, a few nods of agreement. My man may rest displeased, but I will certainly soar and sit up on the fan again! And truth be told, the view from up here is unmatchable and something I want to get used to. Hilarious...I tried cooking once when my wife had been to her parent's place.Every five minutes I would call her and take dictation.At the end, my maths told me that I could get a sumptuous meal outside with the amount I spent on cell phone.That was the last time I cooked something of *substance*...Great Post,as always. Haha, Rajesh. Well, you little "encounter" with the kitchen kind of affirms all points that I mention in the post. :D Thank you for reading! Right..Let's see...where do I start? Great topic for your 100th post Sakshi. Kudos on your milestone! 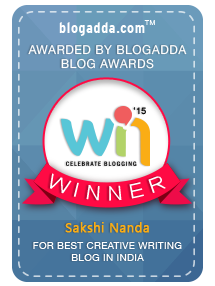 You really are our Sachin of the Blogosphere! There are two parts to my comment. The first part is my observations of other men cooking in the kitchen and Sakshi as usual, has hit the nail on the head. Despite the humor in the post, she highlights some extremely important home truths in this post. Those are the fact that men take their cooking very seriously and make it a point to cook as per the book and not go by their instincts. Maybe it has to do with the fact that they trust cook books more than their cooking instincts, if they have any in the first place. Second points she makes which is extremely relevant is the fact that the kitchen looks more like a mine field after the man of the house has finished his cooking. Third point that she makes which is so so true is that men rarely deign to cook everyday food, it has to be something exotic and out of the ordinary when they cook. The second part of my comment comes to my observations of my own cooking. First up, I don't cook by the book at all and am a completely instinctive cook, and although it has landed me in lots of trouble (read under cooked vegetables, less salt, burnt food) I never learn and never ever take a recipe with me to the kitchen. Second point, I try to cook regular food most of the times and stay away from out of the ordinary dishes as they turn out to be out of the ordinary disasters when they go bad. Loved this post, and Rekha, am truly jealous of the fact that Sakshi chose your blog to debut with her first ever guest post. As is the norm with all her posts, this one well and truly spoke to me in more ways than one!!! Awesome post, and may this be the first of many more to come. Congrats, Sakshi! I have been meaning to ask you since a long time -- how do you manage to post so frequently? :) My heartiest best wishes and hope you continue to thrive and grow and spread sunshine through your writing! Does 'the man' read your blog as often as he cooks ;) great going Sakshi, now that you are here, i should put my lazy fingers on the keyboard more often :D.
Thanks for reading. Good to see you around! Congrats Sakshi on your 100th post! Congratulations on your 100th post Sakshi :) Loved the article! Now, I'm off to read the post! Shall comment there. I posted a comment over there (where? there! in that other blog) addressing each point. Good read like most of your stuff.